Elton John and Leon Russell appeared on World Cafe. From his start with the band Bluesology in 1961, multi-award winner Elton John (born Reginald Kenneth Dwight) has time and time again proven himself to be one of the most iconic singer-songwriters of our day. Rising to international fame by the 1970's with the hit "Your Song," Elton has since released an overwhelming number of studio albums, many of which have climbed their way to the top of the charts. In the '90s, he expanded his career to encompass solo studio albums, collaborations, Broadway compositions (Billy Elliot, Aida), movie scoring (The Lion King), and charity foundations (Elton John AIDS Foundation). His contributions to music and charity did not go unnoticed; in 1994, he was inducted into the Rock and Roll Hall of Fame and in 1998, Queen Elizabeth II knighted him as Sir Elton Hercules John. 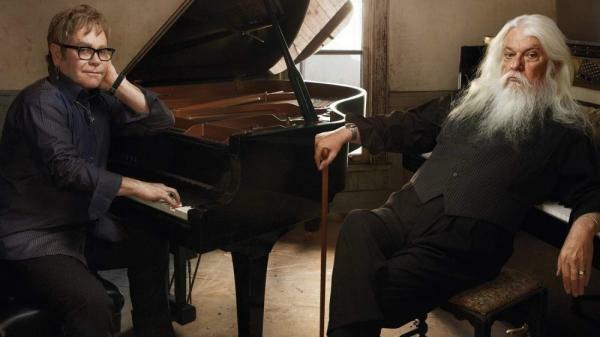 John added to his legacy last year with The Union, which he made with Leon Russell. Russell, who was recently inducted into the Rock and Roll Hall of Fame in March, has built a strong career as a session musician, solo songwriter and collaborator. He has worked with a long list of top artists, covering everything from pure rock to blues and gospel. His resume of albums date as as far back as the late '60s. The two Hall of Famers sit down with World Cafe guest host Michaela Majoun for a special, in-depth interview. This segment originally aired on May 30, 2011.